Patrick Spaziante is a comic artist from Dreamwave comics. His most recent work can be seen in Mega Man #4, but he has also done numerous artwork of other famous characters such as Sonic the Hedgehog. A comic book artist for nearly twelve years, his talent and skill are known throughout the community. Recently, our own LBD "Nytetrayn" had the chance to sit down and ask Mr. Spaziante, or "Spaz" as he's also known, a few questions. Mega Man Network: What did you work on before you worked for Dreamwave? How did you break into the comic industry, and long have you been working as a part of it? Patrick Spaziante: Before Dreamwave, I had worked at Archie Comics as a staff production artist for just about ten years, as well as the odd freelance job for different companies on my off time. My first comic job was Sonic the Hedgehog, for Archie Comics. As a staff artist, I had worked on the production of this, as well as, many other in house titles. Being a video game fan, I was especially drawn to Sonic, and after much badgering and many sample pages, the editor decided to give me a shot. All in total, I would say that I have been in the comic book industry eleven years. MMN: Who do you consider to be your inspiration, or your role-model in the industry? And has your art style been influenced by that person? Spaz: My role models tend to include an eclectic bunch of individuals from here and there. If I was to narrow it down, I would have to say that Capcom's artists, particularly, Bengus, of Streetfighter/Darkstalker/etc. fame, is my favorite. His perfect blend of "cartoony" exaggeration and anatomical realism, as well as the emotion brought forth through his character designs, have greatly affected my work and consistently raised the bar that I strive for. MMN: People recognize your work from Dreamwave's Mega Man #4, Archie's Sonic the Hedgehog, Diehard Gamefan magazine, and soon, the Artbox Mega Man trading cards will be added to that list. Up to now, what has been the highlight of your career, and what do you think people will remember down the line in another 10-15 years? Spaz: It is hard to lock down a single moment/experience as a defining moment in my career thus far. In my mind, I am still just getting started, so it is hard to speak of highlights just yet. I am extremely pleased to be able to work on so many different properties that I have loved since I was a teen, and I look forward to working with more in the future. As far as another 10-15 years, I hope to inspire others, the way so many have inspired me. MMN: Are there any books or properties which you would like to work with, but have not yet been able to? Spaz: There are so many properties out there right now, that to settle on one is tough. I am very grateful for the work I do receive, and am always on the lookout for future jobs. MMN: How about any of Dreamwave's current titles? Spaz: There are definitely some other Dreamwave titles in which I would be interested in. Any of the other Capcom properties, Transformers, Duel Masters, Warlands, etc. MMN: What other interests do you have? TV, video games, music, movies, etc? Spaz: Video games. Movies. Bodybuilding. Biking. MMN: Your work in Mega Man #4 suggests that you've been a long time fan of Mega Man. For how long have you been a fan, and do you have a favorite series and character? Spaz: I have been a fan of Mega Man since the first game. My favorite series is still the original. My favorite characters are Mega Man, Bass, Dr. Wily, Zero (from the X and Mega Man Zero Series), and various boss characters from several games. MMN: What do you like about these characters? Spaz: Mega Man is the game's hero and a classic video game Icon. Bass is a very unique and all around cool design from both a visual and personality standpoint. 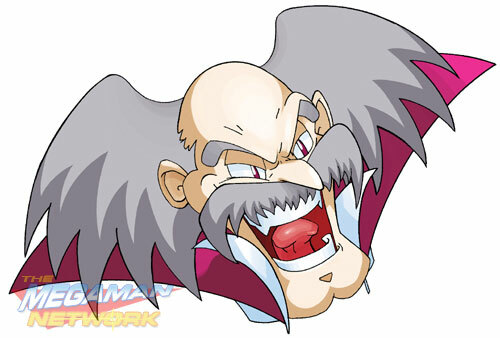 Dr. Wily is a maniacal and twisted Robo-genius. He is both fun to draw, and perfect as Mega Man's arch nemesis. Zero, to me, falls within the same "cool factor" as Bass. His character is unique and dynamic. When I say various bosses, I refer to many that have appeared throughout the Mega Man series, including Elec Man (Mega Man 1), or Tengu Man (Mega Man 8 ). Some I admire for visual presence (Air Man), while others for their powers or overall whimsy (Clown Man). Spaz: My favorite game is Mega Man 8. MMN: What makes this title your favorite? Spaz: Mega Man 8, to me, is the culmination of perfect Capcom playability, graphic flare (heavy on the CPS 2 visual style), sound, and storyline presentation (Mega Man anime cut sequences!). It had the length and difficulty of an old school platformer, although not nearly as difficult as the first few MM games, and I thoroughly enjoyed it. MMN: Which do you prefer? Rockman(original Japanese) or Mega Man(US version)? Spaz: I do like Rockman, but I've grown up knowing the character as Mega Man. MMN: Have your years of work on Sonic had any influence on your Mega Man work? Spaz: Some of the layout techniques that I had learned with Sonic were applied when doing Mega Man. MMN: We now know who your favorite character is from Mega Man, but who is your favorite character to draw? Your least favorite? Spaz: My favorite character to draw is a toss up between Dr Wily, and Bass. Dr. Wily's consistent ramblings and all out cartoonish lunacy, allows for some great characterizations with which I get a chance to be very creative with both facial expressions and body language. As far as Bass is concerned, I really like his character design, and find him to be a very distinctive figure in the Mega Man universe. I don't think that I have a least favorite as I like pretty much every character I have drawn concerning the Mega Man universe, and look forward to trying my hand at some of the more obscure players in the ongoing Mega Man saga. MMN: When drawing a character with an established look, are there any specific rules that you follow? Do you find yourself taking creative liberties often? Spaz: Every licensed character that I have worked on has come with his/her set of guidelines to follow. There are some liberties allowed when drawing these, especially in the Comic venue, but more often than not, these liberties are set within strict limits, in order that the character is still representative of it's original source material. MMN: How about new, original characters? Are there any guidelines you follow for when you create them, self-imposed or otherwise? Spaz: As far as original characters created for a set universe, in this case, Mega Man, I enjoy creating unique designs. I do follow a set of self-imposed guidelines when designing characters for other properties. For instance, in Mega Man's case, I feel unique characters would have to fit the basic Mega Man character structure, short, squat robots, with less emphasis based on tech, and more based on expressive design and personality. MMN: You've worked on comics for two of video gaming's top stars at two different companies. How do the two compare, and was there a need to adjust when starting to work for Dreamwave? Spaz: Working on Sonic, as far back as I have, the source materials came from the original DIC animation television show, which ran on Saturday mornings in the middle 90's. Because of this, Sonic has gone through many changes over his 10+ year stint as a comic book character. There has been much adapting and changing of style in order to fit the ever-changing mold. As far as Mega Man, because the source material was based on the game character, rather than a television adaptation, I was allowed to use various Japanese source materials from the outset of my work on the book. MMN: With many different anime and comic book conventions occuring all the time in various locales across the United States and Canada, are there any that you visit? Any favorite experiences? Spaz: There are many which I would like to attend, but scheduling and work do not allow it. I was invited in 1999 to the E3 convention in LA for my work on Gamefan Magazine, but that's as close as I have come to attending anything remotely related to an Anime convention. MMN: Is there a way for fans to contact you? Spaz: At the moment, nothing yet, but I am working on it. MMN: Any advice for aspiring artists looking to get into the industry? Spaz: The best advice that I can give is hard work, and patience. I know that sounds like a school motto, but I have been drawing since I was four years old, and I am still learning new techniques all the time. You have to always keep practicing and refining your talent. MMN: Thank you for your time, and for answering our questions, Mr. Spaziante. One last question: Would you like to work on a Mega Man comic again, and if so, what sort of story would you like for it to be? A huge thanks to Patrick for answering our questions, as well as the exclusive art for our feature here at The Mega Man Network. We wish you the best of luck on your future endeavors, which we hope will include more Mega Man work, and including your part in the new Artbox Mega Man trading cards which will be on sale soon!